Accordingly, we, with full trust and loyalty, accept and put into practice the perfect and unalterable truths and moral standards taught by the One, Holy, Catholic and Apostolic Church instituted by Christ Jesus and being constantly sustained and guided by the Holy Spirit. At the same time, we are aware and believe that God sometimes intervenes in the flow of human lives especially when He sees erroneous ideas or decaying moral habits severely threaten the life in the Church and the world, usually by sending the Blessed Mother, Saints, or angels to the earth. We see numerous records of God’s special interventions in the Old Testament and also many charismatic interventions in the matters on the earth in the New Testament age as well. Among all of Our Lady’s interventions in the world, the most important one is her apparition and miracle at Tepeyac hill in the Aztec empire (currently, Mexico) on December 12, 1531. The sixteen century was the period of rapid and ground-shaking changes in the world as the Middle Ages ended, the Protestant separation occurred and spread, and the New World of the Americas was being opened to the Western countries. Through her unprecedentedly amazing miracle of her beautiful and supernatural Image appearing on Juan Diego’s tilma before Bishop Zumárraga and others, Our Lady began putting an end not only to the centuries-long tradition of worshipping the false gods but also the dreadful custom of sacrificing so many humans to appease the angry false gods which were just made of rocks. The effects of Our Lady’s miracle was tremendous. The custom of human sacrifices was completely eliminated and about 10 million Aztec Indians abandoned worshipping the false gods and embraced the Catholic faith in the true God and trusted Mary, the Mother of God, as their Mother also in a relatively short period of 7 years. The miraculous Image of Our Lady of Guadalupe was placed high on the front wall of the Basilica in Mexico City and has been supernaturally sustained without damages for almost 500 years until now. The fact that this Image was miraculously impressed on Juan Diego’s tilma, which was made of coarse fabric, normally lasting for only 20 to 30 years, and has continued until today has been a most amazing miracle. In addition, Our Lady has frequently protected the people of Mexico and others from inundating floods, tenacious epidemics, and many other difficulties in the past 500 years. The trust in Our Lady of Guadalupe has firmly landed roots in the hearts of the Mexicans and other Latin Americans as their Mother and Queen. More recently, however, Our Lady of Guadalupe has been making known that her plans that began in 1531 have never been ended but still continue. She announces that her intension is to end all abortions and convert and bring millions of people in the world to her Divine Son Jesus through her Immaculate Heart. This will be the greatest ever and worldwide mission entrusted to Our Lady by the Holy Trinity, far more important and difficult than any of her other missions before. Her new plans are: (1) to end all abortions and (2) to convert and bring all her children in the world to her Divine Son Jesus through her Immaculate Heart. Between 1990 and 1992, Our Lady gave messages six times to Ken Staloch, a well-respected lay person near Seattle, announcing her plans for our current times. Through Ken, Dan Lynch (a lawyer in Vermont) and Fr. Walter Winrich (American Maryknoll priest working in Mexico), Our Lady asked the Cardinal and Bishops of Mexico City to help her in her new plans. The leaders of Mexico’s Catholic Church agreed to help her and gave the extremely accurate replicas of the original Image of Our Lady of Guadalupe of 1531 to the USA and other countries in the Americas. This made it possible that the tour of the Missionary Image of Our Lady of Guadalupe began in the USA in April 1991 and the tours have continued until now. For the past 24 years, the Image visited more than 1,000 Catholic parishes in the USA and many foreign countries as well. Millions of people have had the chance to see the Image of Our Lady and pray and Our Lady responded with miracles and other graces filled with motherly love. The positive effects of these tours have been enormous in helping the propagation of Our Lady’s Image and her plans. Also, those women who were thinking about abortions realized that abortion is not a simple medical surgery but a real, terrifying killing of their own babies. The tours of the Missionary Image of Our Lady of Guadalupe for 24 years have been enormously successful as so many people could come to the Image and see the Image. This strengthened their faith and made them closer and more intimate to Our Lord and Our Lady. Their faith became deeper and stronger. However, what Our Lady wanted was much more than that. She did not just want a few million people given the chance to see and touch her Image. She wanted all the people in the world could see her easily and all the time, not because she wanted it for herself but for the benefit of her children. It has become obvious now that Our Lady has had more plans and ways to accomplish her intentions completely. Our Lady repeatedly emphasizes that her plans of ending all abortions and bringing all her children to her Divine Son Jesus are to be accomplished through the miracle of her Image. Let us keep in mind that our closeness and unity with Our Lady should be permanent and growing, not just lasing for some time, as Our Lady Herself is perfectly and permanently united with Our Lord. Our Lady said: “I will melt your hearts with my motherly heart filled with love for you. I want you to give all your prayers, works, joys and sufferings with me, in me, through me and for me so that I may lead you safely to my Son Jesus." (August 14, 1990) For us to be closely with Our Lady all the time and grow in it, the small Special Photograph of the Missionary Image of Our Lady of Guadalupe taken on August 15, 1991 is ideally useful. There is even some similarity between this photograph and the Holy Eucharist. Of course, there is some important differences: the Holy Eucharist is a Sacrament and the Real Presence of Our Lord in the Eucharist is a Church Doctrine, while Our Lady’s photograph is not a Sacrament and her Presence with this photograph is not a Church Doctrine. This does not mean, however, that this photograph of Our Lady is not important or is not intimately related with Our Lady’s living Presence. The new images in this photograph are also supernatural as they were made by God and Our Lady in Heaven. We can believe that, as long as we are with this photograph and, at the same time, with firm faith in and love for Our Lady, she will surely be present with us through this photograph of hers. It is an infinite Wisdom of God that Our Lord is one Person but His Presence can exist in all humans at the same time through the Eucharist. Likewise, Our Lady is one person, but, through this photograph of hers, she can be present with all of us at the same time. When we are with Our Lord and Our Lady, it is the same as being in Heaven. How great gifts from God the Holy Eucharist and Our Lady’s photograph are! His Excellency Archbishop Alexander Sample already approved the spreading of this photograph. Fr. 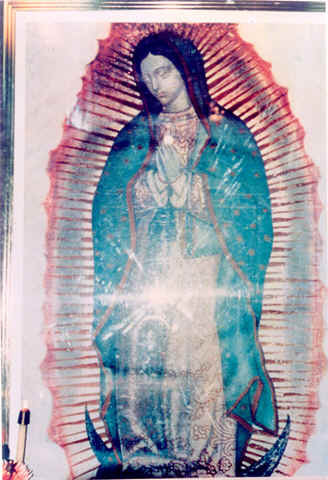 Peter Fehlner, the previous rector of The Monastery of Our Lady of Guadalupe in La Crosse, Wisconsin stated that he was convinced that the new images in this photograph were miracle. Our Lady eagerly wishes that we spread and explain this photograph to more persons in the world. ─ Mary’s Touch By Mail, P.O. Box 1668, Gresham, OR 97080, USA, 11/21/15.